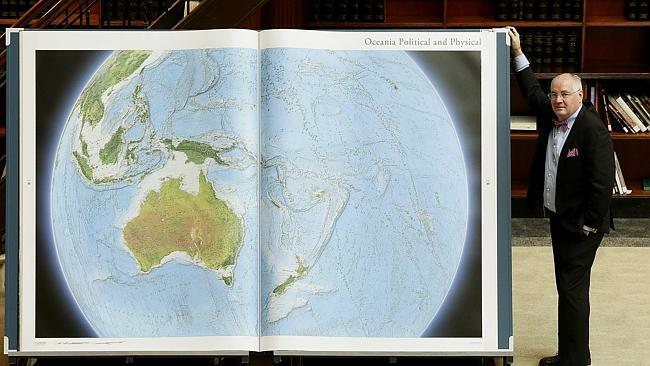 A Sydney publisher has put Australia (and the rest of the world) on the map after bringing out the world’s largest atlas. The happily-named Gordon Cheers first dreamed up the atlas 25 years ago, after seeing the huge Klencke Atlas at the British Library, presented to King Charles II in 1660. The Earth Platinum atlas weighs 150 kg, is 1.8 metres tall and 2.7 metres across when it is open; it is 128 pages long, and each page needs two people to turn it. There are 61 pages of maps compiled by a team of 88 cartographers, showing maps of the continents and oceans, and very detailed regional maps. As well as a double-page layout of the world’s flags, there are 27 photographic image of famous locations. One of them also broke the record for the world’s largest image in a book – it’s a picture of the Shanghai skyline made from over 12 000 photos. Last year the Earth Platinum atlas was recognised by the International Map Industry Association, and it has also entered the Guinness Book of World Records. Only 31 copies of the limited edition atlas were produced, each one costing $100 000. One copy belongs to the British Library, who plans to exhibit it for six days each year. Officially launched on June 26, the only copy of Earth Platinum in Australia can be seen at the State Library of New South Wales until July 19. In Greek mythology, Atlas was one of the Titans, the ancient gods who preceded the Olympians, and who were the children and grandchildren of the earth goddess Gaia, and the sky god Uranus. The younger generation of gods, led by Zeus, waged war against their elders, and eventually prevailed, gaining dominion over the world. Atlas was one of the leaders of the Titans during the war, and was given a special punishment – for all eternity, he was condemned to stand at the western edge of the earth (Gaia) and hold up the heavens (Uranus) on his shoulders, so that the twain should never meet. Once the sky was able to lie upon the earth each night and mate with her, and from these couplings were born the Titans: now Zeus demanded that Atlas keep them separated forever, so that they could conceive no further gods. In other words, Atlas was to be used as a contraceptive device for deities. Another tale tells of a giant named Atlas who tried to drive away the hero Perseus, fearing that he would steal the golden apples from Atlas’ garden. For this he was turned to stone by the head of the Medusa, becoming the Atlas Mountains in northern Africa. This contradicts another story, where the hero Heracles had to fetch the golden apples from Hera’s garden, which was tended by Atlas’ daughters, the nymphs called the Hesperides. Heracles asked Atlas to fetch him the apples, offering to hold the sky up while he ran the errand. Atlas tried to trick Heracles into taking on the job permanently, but Heracles asked Atlas if he could just hold up the sky for a few minutes while he arranged his cloak as padding for his shoulders. Once Atlas took the heavens again, Heracles grabbed the golden apples and hoofed it, leaving Atlas holding the baby. There is a nicer ending to the story, where Heracles built the Pillars of Hercules, the peaks flanking the Strait of Gibraltar near Spain; one of the pillars is the Rock of Gibraltar. Heracles told Atlas that from now on, the Pillars would hold up the heavens, liberating Atlas from his burdensome task. It is not certain what the name Atlas means. The Roman poet Virgil translated it as related to “enduring”, possibly because he knew that a local name for the Atlas Mountains was Douris. Etymologists tend to interpret it as meaning “uphold, support”, although the name may actually be pre-Greek. The name of the Atlas Mountains is thought to be derived from a Berber word simply meaning “mountain”. The Atlantic Ocean is named after Atlas, because it was seen as the western edge of the world. The mythical doomed Atlantis, vaguely located beyond the Pillars of Hercules in the Atlantic Ocean, means “island of Atlas”. Plato says that the first king of Atlantis was named Atlas (not the Titan, but a son of Poseidon), and some believe that he based him on a legendary North African king named Atlas, a skilled astronomer and inventor of the first celestial globe, which mapped the constellations. The connection with North Africa and the heavens suggests the legendary king was inspired by the Titan. It was 16th century geographer and cartographer Gerardus Mercator who first used the word atlas to mean a collection of maps, dedicating his own atlas to honour King Atlas, the legendary African astronomer. However, he conflated the king with the Titan Atlas, and even before that it had become traditional to show Atlas holding up the celestial spehere on early maps. Because of the connection with maps, we sometimes think of Atlas as holding up a globe of the world, although it is a puzzle how Atlas could stand on the earth while holding up the world. Atlas has further connections to the heavens, because it is a star system in the constellation of the Pleiades, which is often called the Seven Sisters. The Titan Atlas was the father of seven sea-nymphs, and after he was sent off to carry the heavens, there was nobody around to take care of his daughters. The girls were pursued by the hunter Orion, so Zeus first turned them into doves, and then into stars so their father might see them in the sky and be comforted. Another story is that the sisters committed suicide in despair at their father’s fate, and were immortalised as stars. Because astronomy places Atlas in the constellation as well, it seems he truly was liberated by Heracles, and can now be with his daughters for all time, protecting them from Orion, who you may still see pursuing the sisters across the night sky. One of Saturn’s moons is named Atlas, because it appears to hold up the rings of Saturn, as if carrying them on its shoulders. It was decided that the major moons of Saturn would be given the names of Titans, as Saturn is the Roman name for Cronos, the head of the Titans. The name Atlas has also been given to one of the craters on our own moon (it’s right near Hercules). Atlas has been used as a personal name since the 18th century, and became more common in the 19th century, especially in the United States. There are quite a few Atlases in Australian records, both male and female, and used as a first and middle name fairly equally. Atlas made a couple of appearances on the US Top 1000 in the 19th century, and began charting again in 2013; it is currently #646 and rising. Actress Anne Heche welcomed a son Atlas in 2009, which seems to have increased interest in the name. In 2013, 12 baby boys were named Atlas in the UK, the name rising steeply since 2011. There is evidence that the name Atlas is growing in popularity in Australia too, although like the UK, still in rare use. Atlas is a powerful, indeed a Titanic name, reminding us of famous strongman Charles Atlas. It suggests the brawn to hold up the heavens, and the fortitude to carry a load on his shoulders without complaining. However, not only are mythological names on trend, we are more comfortable now bestowing big names on little babies, and giving them something to aspire to. And Atlas isn’t just a dumb muscle man – he’s a philosopher king who studied the cosmos, and glittering stars in one of the most familiar of our summer constellations. The name Atlas has also been chosen for several comic book and video game characters, giving it a bit of geek chic. In short, if you are among the growing number of parents who are drawn to Atlas, you will be getting a strong yet simple name with a mountain of history, a world of legend, and an ocean of science behind it. Not to mention one heck of a lot of geography! Atlas received a decent approval rating of 65%. 17% of people thought it was too closely associated with the book of maps, but 16% saw it as strong and powerful, and another 16% as cool and different.